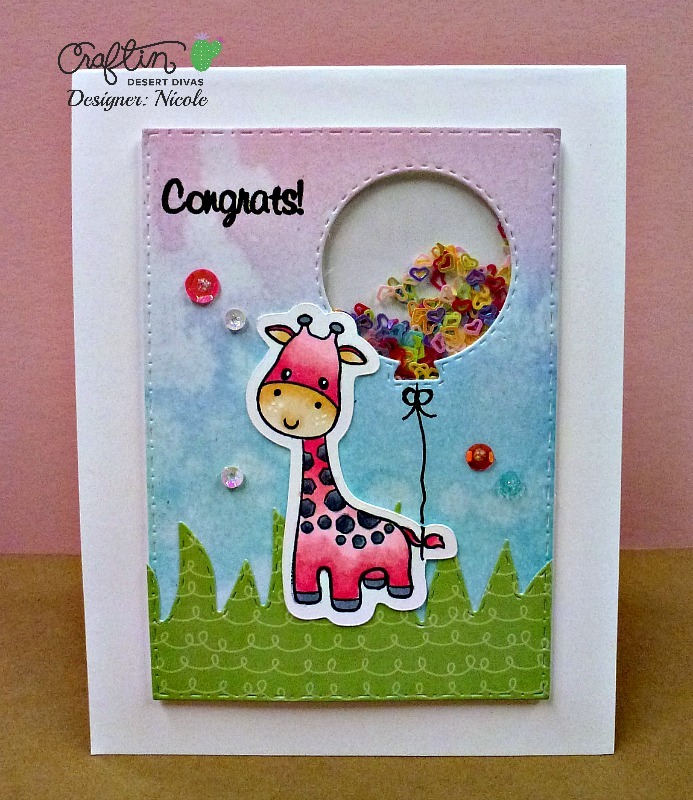 Hello there, Nicole here today and I have a special card to share with you. I have a friend who recently adopted a daughter from Eastern Europe and I wanted to send her a small gift and I created this card to go with the gift. I created my background first using 4 different distress inks. After I blended them I spritzed with water, dabbed with a paper towel and then dried with my heat tool. Then I die cut my paper with one of the "Fancy Frame Dies". 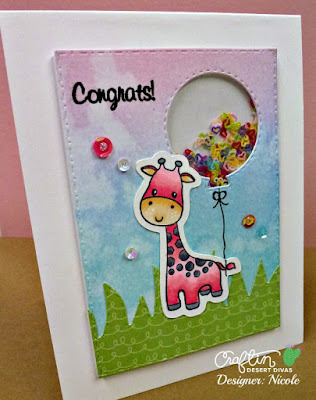 Next I cut out the balloon for the shaker portion of my card using the "Party Dies". Finally I cut out the grass using the "Outdoor Landscape Dies". I also cut the bottom of the grass with the same frame I used for my background rectangle so that it would have the same stitched line along the bottom. After I got this put together I then assembled my shaker layer using the "Heartbraker Sequins". 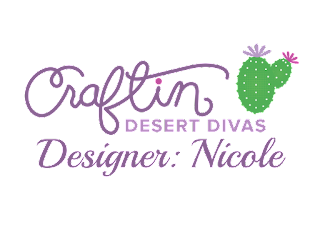 Finally, I cut the cute little giraffe out using the "So Long SVG" file and my Silhouette. Then I stamped her with the "So Long" mini stamp set and colored her in with alcohol markers. Finally I scattered a few miscellaneous CDD sequins on the front of my card. I decided to just hand draw my balloon string and ribbon. Thanks for stopping by today!! What a sweet and cute card to celebrate this special day! Love it! And Congratulations for your friend, Nicole!